Printfolio Bundle is a suite of four professional Mac OS X printing programs plus image editing program - Image Tricks Pro. With this suite you can easily create business cards, CD/DVD covers, labels, tray inserts, folded booklets, flyers, brochures, letterheads, newsletters, catalogs, etc. The program will also help you design and print envelopes, postcards, address and shipping labels. Prepare unique business cards and update your card information, if your contact information changes. Create flyers, brochures and catalogs which are a great source of promoting your service. Make beautiful-looking CD and DVD covers for your music collections. Mark your backup discs in a convenient way to have all your backups in order. Maintain a corporate look of your business correspondence. Automate your postal correspondence if you have a large mailing list. Disc Cover is a program for making personal covers and labels for CD, DVD and other media. It conveniently imports data from iTunes, iPhoto, Aperture, music discs and offers a creative way to decorate your work. Business Card Composer helps you design and print business cards, calling cards and badges. Address Book and iPhoto integration allows you to easily use necessary data and photo on the card design. Swift Publisher is a page layout application for preparing high quality flyers, newsletters, brochures and catalogs. Various text and image editing capabilities make desktop publishing a breeze. Labels & Addresses is a tool for printing single or multiple labels, envelopes or postcards. The program uses addresses stored in Apple Address Book, MS Entourage, MS Excel, FileMaker or built-in address storage. You can even print numerous barcodes from an external data list. Image Tricks Pro is an image editing and image generating software. It creates unique artwork that can perfectly fit business card background, enrich print materials graphically or be used in web design. The Printfolio Bundle contains 1,200+ professionally designed templates for business cards, CD/DVD labels, flyers, newsletters and other designs will help you accomplish various printing projects. Implement your creativity using one of 1,000+ clipart images (40,000+ high-quality images with Extras Pack), 100 additional fonts (Extras Pack only). The Printfolio Bundle has extended library of label and paper layouts from the most popular manufacturers (Avery, Neato, Memorex and others). Furthermore, it prints all sorts of design elements: CD/DVD covers, labels, tray inserts, folded booklets, mini discs labels, VHS wraps, business cards, envelopes and more. Direct-on-CD, label printers, as well as standard inkjet and laser printers supported. This bundle includes: Disc Cover v3.0.6, Business Card Composer v.5.1.4, Swift Publisher v2.3.8, Labels & Addresses v1.6.3, Image Tricks v3.0.4. 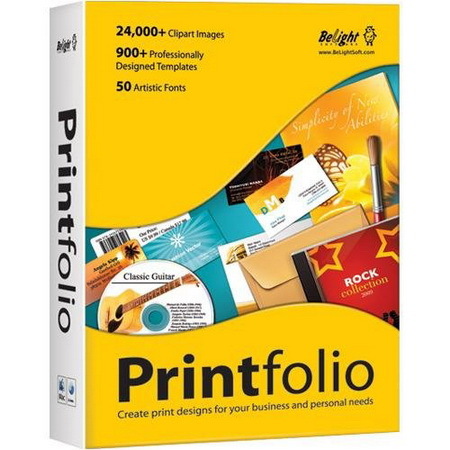 BeLight Printfolio Bundle - 12.2011 (Mac OS X) download links are externally hosted on Extabit, Rapidshare, Rapidgator, Netload, Uploaded and BeLight Printfolio Bundle - 12.2011 (Mac OS X) also available directly on Torrent Sources.